The Metropolis Collection is about clothes for the city. Wool coats and ensembles, urban wear designed to make a classic statement. Mix and match these items with your existing Barbie and Ken accessories. Ken is photographed with his models in Collins Street, Melbourne, the chic place to be seen shopping. Teresa wears a classic styled trench coat, made from felted wool. It is finished with contrasting square buttons and a silver buckle. Teresa has accessorised her outfit with the Barbie Basics Collection of accessories. Ken wears his classic charcoal coloured woollen trousers. 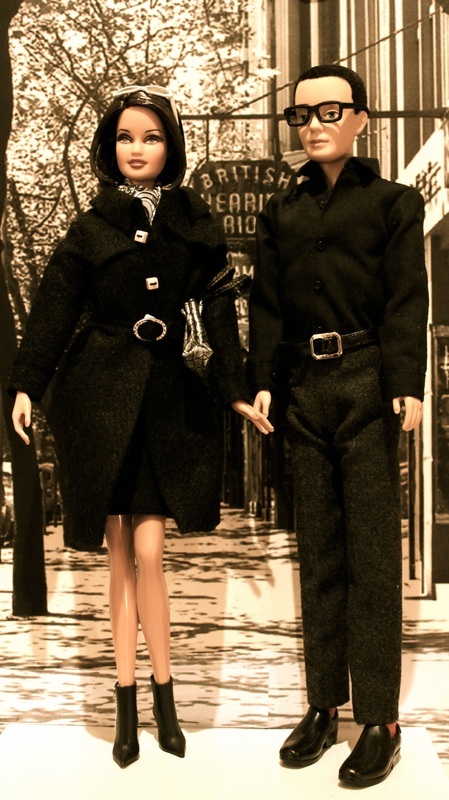 Barbie wears a two piece felted wool dress featuring a buckle detail at the waist. Ken's signature black and white houndstooth is featured in an Empire line dress. A co-ordinating handbag and shoes finish this ensemble. Hot pink 'patent leather' trims this charcoal and fuchsia felted wool dress and jacket. A creamy coloured felted wool trench coat is teamed with a tweed dress. An olive felt band trims the bucket shaped hat. 1960s style 'A-line' camel wool felt coat is finished with silver buttons.